Little known outside his native Australia, David Stove was one of the most illuminating and brilliant philo-sophical essayists of the postwar era. A fearless at-tacker of intellectual and cultural orthodoxies, Stove left powerful critiques of scientific irrationalism, Dar-winian theories of human behavior, and philosophi-cal idealism. He was also an occasional essayist of considerable charm and polemical snap. Stove's writ-ing is both rigorous and immensely readable. It is, in the words of Roger Kimball, "an invigorating blend of analytic lucidity, mordant humor, and an amount of common sense too great to be called 'common.'" 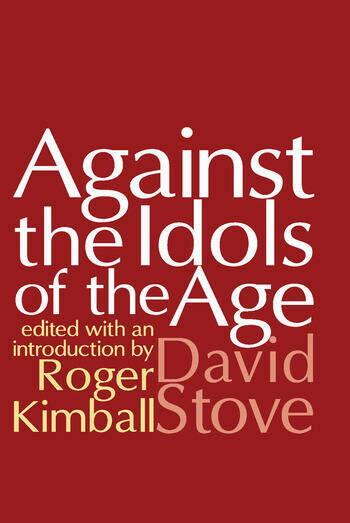 Against the Idols of the Age brings together a repre-sentative selection of Stove's writing and is an ideal introduction to his work. The book opens with some of Stove's most impor-tant attacks on irrationalism in the philosophy of sci-ence. He exposes the roots of this fashionable attitude, tracing it through writers like Paul Feyerabend andThomas Kuhn to Karl Popper. Stove was a born controversialist, so it is not surpris-ing that when he turned his attention to contemporary affairs he said things that are politically incorrect. The topical essays that make up the second part of the book show Stove at his most withering and combative. Whether the subject is race, feminism, the Enlightenment, or the demand for "non-coercive philosophy," Stove is on the mark with a battery of impressive arguments expressed in sharp, uncompromis-ing prose. Against the Idols of the Age concludes with a generous sampling of his blistering attacks on Darwinism. David Stove's writings are an undiscovered treasure. Although readers may dis-agree with some of his opinions, they will find it difficult to dismiss his razor-sharp arguments. Against the Idols of the Age is the first book to make the full range of this important thinker available to the general reader.